"Take control of your 'Siemens' mobile Phone Book, Calls, SMS Messages, General Info etc. and expand its features!" GSM Control is a all-in-one software solution that will incorporate usage of all your mobile's features and take it to the higher level. In order to establish communication between your Siemens mobile phone and your PC, you will need data cable or IrDA interface. Now you don't need to type on that small mobile's keyboard for hour or two when entering, lets say, 50 contacts in your mobile. Pull any information you want from your mobile. With GSM Control you can easily work with SMS messages, see your mobile's missed, received and dialed calls, work with appointments, check or set mobile's diverts, barrings or locks, set your new mobile's logo or ringtone, exchange your mobile's contacts and appointments with those from Microsoft Outlook, and many more. 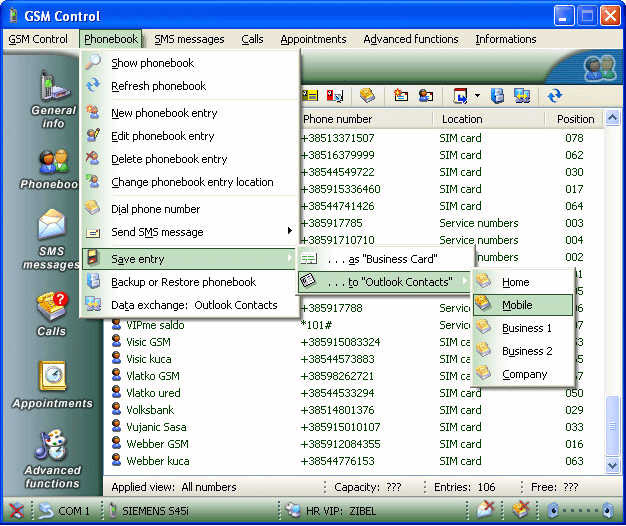 Phone Book -- Control Your Mobile's Contacts Easily! With GSM Control you can easily manipulate Phone Book entries in your mobile phone. You don't have to spend hour or two anymore while entering about 50 or 100 entries in your mobile's Phone Book. GSM Control will let you to add new entry, edit existing entry, delete existing entry and change entry location (SIM <> Mobile Memory). You can even dial phone numbers and send SMS messages directly from Phone Book. Calls -- Your Calls History Just in Front of You! GSM Control will extract all your dialed, received and missed calls from your mobile phone, so you can simply add new caller to your Phone Book, dial phone numbers or save phone call lists to your hard disk. General Info -- Know Your Mobile's Technical Info! GSM Control will help you to see a following specific information from your mobile: Manufacturer, Model, Software Version, Mobile Status, IMEI (Mobile Serial Number), IMSI (International Mobile Subscriber Identity), SIM ID (Serial Number of SIM Card) and Date/Time on your mobile. SMS Messages -- Have FUN and Make It... FAST! SMS messages are the most popular type of communication today. GSM Control will let you easily manage your SMS messages. Communicating via SMS messages is now enjoyable, simpler and much faster. With GSM Control you can send, receive, save, edit, delete and reply SMS messages. While sending a message, choose between Normal or Flash SMS message. Also, GSM Control has an option to work with Delivery/Status Reports. Appointments -- Schedule Your Tasks With Ease! Manipulate Appointments stored in your mobile phone with ease. 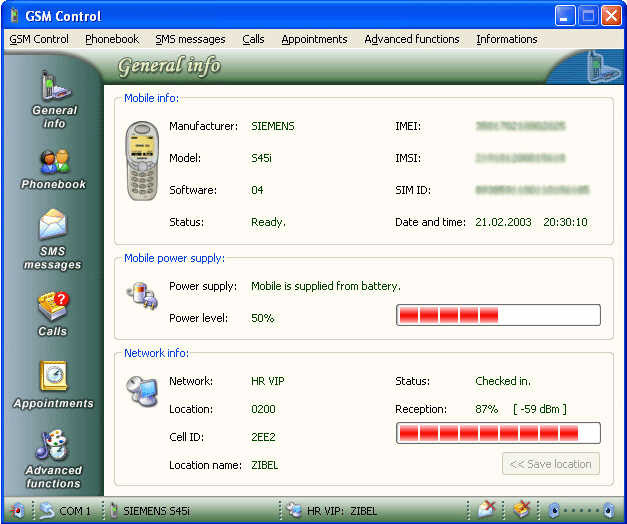 GSM Control will help you to easily add, edit and delete your mobile's appointments. You can even exchange your appointments with those from Microsoft Outlook Calendar. Advanced Functions -- All You Need Is... HERE!